So the sensational summer of sport is finally at an end. We've seen lifetime best performances, new world records set, huge crowds inspired - and a mountain of medals won. From Bradley Wiggins winning the Tour de France, to Sir Chris Hoy and Neil Fachie burning up the Olympic and Paralympic velodrome, to Andy Murray adding grand slam glory to Olympic gold. It's been an unparalled, unprecedented few months of British (and, of course, Scottish) sporting achievement and we're still basking in the afterglow. In recent days, tens of thousands of people have lined the streets of the athletes' villages, towns and cities to congratulate them on their success. For the competitors, another welcome chance to offer thanks for such incredible support, as well as to wallow in a little more glory. Since the famous flame first appeared in Britain in May, it has fanned an Olympic feel-good factor across the UK of whicheven the London 2012 chairman, Lord Coe, could scarcely have dared dream. If, for his next trick, he could capture and bottle it for posterity - or, better still, make good all the "legacy" promises - then his work truly will be done. So what was your London 2012 highlight? Difficult, isn't it? Viewing things from a purely Scottish perspective scarcely cuts down the options. The tartan element in Team GB and Paralympic GB performed superbly. A record medal haul of 13 at the Olympics featured seven gold, four silver and two bronze; the first time a Scottish contingent has ever returned from a Games with tally of gongs in double figures. The Scottish Paralympians, too, were in double digits - and easily surpassed the achievements of Beijing four years ago. Three gold, six silver and two bronze medals is a more than decent return on the big money that's now invested in para sports. But, rather than the gold standard set by the likes of Murray, Hoy, Fachie, Katherine Grainger and David Smith, arguably the most inspirational performances came from a name far less heralded. Twice Andrew Mullen came close to a bronze medal in the Paralympic pool. While fourth place is the most frustrating finish in any final, this Glasgow athlete will draw great strength and encouragement from his efforts in the 50m backstroke and butterfly. As will anyone who witnessed them. Andrew was born with only his right leg fully formed yet started training with the Temple swimming club aged seven. Last year, he was named Scottish Disability Sport's athlete of 2011 for his medal-winning performances at the European Championships. So what's the next step after his two fine swims at London 2012 this summer? Fifth year at school. Andrew doesn't turn 16 until the end of November. No wonder he's regarded as the brightest young prospect in British para swimming. I imagine Rio 2016 can't come quickly enough for that young man. And he's certainly one of the heroes of London 2012. The others, of course, were more predictable. Paralympic rowing and cycling gold for Aviemore's Smith and Aberdeen's Fachie. A superb swimming silver medal in the Olympic pool from Glasgow's Michael Jamieson, who was only beaten to gold by a new world record from his Hungarian rival. That Scottish silver easily made my own top three highlights. I was also privileged to witness - and hopefully convey some of the excitement live on BBC Radio Scotland - Hoy cycling into Scottish and UK sporting history as the greatest British Olympian of all time. The noise created by 6,000 ecstatic spectators in that velodrome as he claimed his second London 2012 gold will never leave me. A sonic boom louder than the one he heard when he subsequently flew in an RAF jet fighter. I shall also never forget the scenes on Wimbledon's centre court as a young man from Dunblane claimed the Olympic tennis gold medal with a straight sets win over arguably the sport's greatest-ever player. Murray's demolition of Roger Federer wasn't just a vindication of his talent and potential. It was also a foretaste of what was to come in New York, where he finally fulfilled his Grand Slam destiny. Having followed him on the world tennis tour since 2009, I was personally delighted with both of his stunning successes this summer. But not in the least surprised. Hard work, it would appear, does pay off. Each of our Olympic and Paralympic medallists will attest to that. 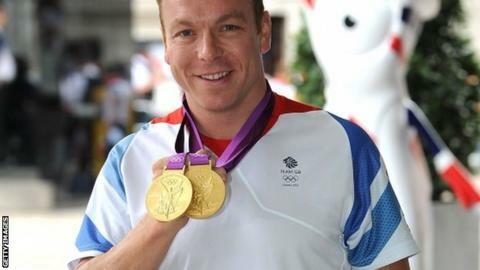 From showjumping's Scott Brash to canoeists Tim Baillie and David Florence; from Judoka Sam Ingram to sprinter Libby Clegg; from medal-winning veterans like Aileen McGlynn to stars of the future like Andrew Mullen. All share not just the Olympian spirit and ideals but a work ethic that can inspire any person in any situation in any walk of life. Their message is simple; regardless of your circumstances, strive to be all you can be. It will, of course, be years before we can properly assess the legacy, if indeed there is any, of this wonderful past few months. The focus has already switched from London 2012 to the 2014 Glasgow Commonwealth Games, which clearly has quite an act to follow. However, well before that, as the spectacular summer of sport gives way to a new season, I'd expect that feelgood factor to help Scotland's Paul Lawrie and the Ryder Cup team give autumn a golden glow too.